DiskWarrior is the most highly decorated Mac disk repair utility ever. It repairs disks that no other program can repair. New hardware monitoring helps protect your data from drive malfunctions. DiskWarrior 3.0 provides Mac OS X native directory repair. This version is not a simple port to Mac OS X; extensive changes have been made to the application, allowing DiskWarrior to take advantage of advanced technologies in Mac OS X. The new version offers dramatic speed improvements, supports file journaling and Mac OS X RAID, offers full Unicode support, conforms to Apple's security standards, uses Mac OS X's native memory model, and rebuilds directories on disks as large as 2,000 gigabytes (2 terabytes). DiskWarrior 3.0 ships on a Mac OS X bootable CD. Added to DiskWarrior is the ability to monitor drive hardware and warn you of impending drive failure. When a drive mechanism fails, the data on the drive can be lost - with an expensive data recovery service being your only option to retrieve your data. DiskWarrior can be configured to automatically check your drives for possible drive malfunction, giving you the opportunity to back up your data before a drive failure. When a drive is in danger of malfunction, you can choose to have DiskWarrior display an alert, send an email, or run an AppleScript. To rebuild the directory on a Mac OS Standard (HFS) or Mac OS Extended (HFS+) disk, DiskWarrior requires a Mac OS computer with a G3 or higher processor and at least 128 MB RAM, regardless of what operating system is installed on the disk to be rebuilt. The disk to be rebuilt must be locally connected, must not be write protected, and must have a valid partition map. If you wish to enable DiskWarrior's automatic hardware monitoring, you will need to install the DiskWarrior application on your computer. To install the DiskWarrior application, you must have a Mac OS computer running OS X 10.2.1 or later with at least 128 MB RAM. Installing DiskWarrior is not required to run the application from the DiskWarrior CD to rebuild a disk directory. If you own any previous DiskWarrior version (2.x or earlier), you can preorder the DiskWarrior 3.0 CD Upgrade directly from Alsoft. The upgrade costs $39.95 plus $7.95 shipping and handling. You must provide your DiskWarrior serial number when ordering, as well as your name, address, credit card number, and expiration date. When your CD has shipped, we will send a notification to the e-mail address given in the order. We estimate that DiskWarrior 3 CDs will begin shipping in early April. If you purchased a new copy of DiskWarrior on or after February 1, 2003, you are eligible for a free upgrade; you will only be charged for shipping and handling. If you purchased DiskWarrior and received a coupon for a free upgrade to version 3.0, you are also eligible for a free upgrade. Note: Unlike some previous versions, DiskWarrior 3.0 does not come bundled with PlusOptimizer. The OrangeCombo PC Card is a unique, compact solution. With a single card you can upgrade the capabilities of your laptop with FireWire and USB 2.0. The OrangeCombo PC Card adds a two FireWire ports to your Mac laptop computer. Now you can take complete advantage of the latest high performance USB 2.0 peripherals. 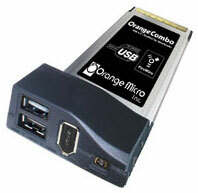 The OrangeCombo PC Card adds two USB ports to your laptop computer. This new technology is "backward compatible" with all USB 1.1 devices as well as USB 2.0 Hi-Speed devices. This means users can run all existing USB peripherals simultaneously with any new USB 2.0 devices at their rated speeds. The OrangeCombo will give you up to 480 Mbits/second data transfer speeds with USB 2.0 devices. That's 40 times faster than the standard USB 1.1 data transfer rate of 12 Mbits/second! The OrangeCombo includes free video editing software, so you can make desktop movies on the move. Now you can shoot and edit you movies with your laptop. One 6-pin and one 4-pin external 1394a FireWire ports. Provides FireWire BUS power on the 6-pin port only when using the included power supply. The FireWire ports will work without the power supply with any devices that come with their own power supply (also known as self-powered devices). Two auto speed selectable Type A USB ports, supports all USB speeds. EHCI based 480 Mbits/second USB 2.0 Hi-Speed compliant. OHCI based 12 Mbits/second USB 1.1 compliant. Provides 5V, 500 mA of power per port when using the included power supply. The USB ports will work without the power supply with low power devices that draw 100 mA or less, typically mice, keyboards, joysticks and any self-powered devices. Many have experienced it themselves or seen others suffering through it - people sitting in a lobby or airport trying to get some work done by balancing a laptop computer and a load of papers precariously on their lap. Now a new portable product called the PC TableTote removes that awkward problem, giving new meaning to the term "lap of luxury." The PC TableTote gives business travelers and consumers a portable workspace to carry with them. The collapsible table is a versatile, stable workstation that can be used in a variety of situations such as airports, hotel or building lobbies, even park benches and hallways. When folded, the patented PC TableTote is a 13 x 11 inch sturdy, space age composite stand that - at only one inch thin - fits easily into a briefcase, laptop case, or backpack. When in use, the table is adjustable to a height of up to 30 inches tall, and the surface work area extends to a width of 18 inches to allow for optimum desk workspace. The lightweight PC TableTote weighs less than 3 pounds and sets up in seconds. It is designed for the business traveler, student, or anyone who can use a portable workstation for laptop use, writing, giving a presentation, or even eating a meal. With aluminum legs, weighs 2.6 lbs. & can support up to 18 lbs. Telescoping aluminum legs will hold up to 18 lbs. evenly distributed; more than enough for laptops and presentation projectors. Constructed of a space age fiber composite filled plastic. This material is injection molded & has superior strength and durability but still maintains a very low weight for ease of transporting. "There is nothing else like this compact, multipurpose table on the market," says Doug Gibbs, PC TableTote Designer. "As a frequent business traveler, I often found myself without a stable workspace when waiting in a lobby or giving a PowerPoint presentation," Gibbs says. "I wanted to design a product that would be compact enough to be portable, yet sturdy enough to be stable and user friendly." The PC TableTote sells for $49.99 and is available through various retailers. MCE Technologies LLC announced internal DVD recordable upgrades for the PowerBook G4, PowerBook G3 (FireWire/Bronze), iBook (Dual USB), as well as several desktop models. "We are truly excited to be the only company to provide such a comprehensive offering of DVD recordable upgrades and solutions for the Mac at a time when DVD-R technology and market demand are just reaching critical mass," states Arnie Ramirez, president of MCE. "In the coordination of such an offering, we have amassed an incredible amount of knowledge and information on video and data DVD creation on the Mac that we will make available to our customers through our website and through our knowledgeable technical support and customer service teams." The just-announced MCE DVD-R upgrades for G4-based PowerBook systems are compatible with Apple's DVD Studio Pro, iTunes 3, Finder Burning and, while not officially supported by Apple, iDVD 3. MCE DVD-R upgrades for G3-based PowerBook and iBook systems are compatible with iTunes and Finder Burning and also ship with a basic Mac-compatible DVD authoring software for the creation of video DVDs as well as video CDs (VCDs). It is the only DVD authoring software of its kind compatible with G3-based machines. The DVD authoring software is only compatible with Mac OS 9 at present, however users will receive a voucher for a free upgrade to the Mac OS X version of the DVD authoring software slated for release by the end of April. In addition, all models ship with Roxio's Toast Lite to facilitate the creation of data DVDs. Prices range from $279 to $449 depending on model. Comprehensive specification and compatibility information for each model is listed on the MCE website. It's finally here - the innovative and stylish PowerSleeve17 laptop sleeve optimized for the new 17" PowerBook G4. Made from real durable ballistic nylon, this padded, top loading laptop case with sturdy snap lock offers room for your PowerBook's power adapter, iPod, and other accessories. PowerSleeve17 comes with Booq's signature detachable shoulder strap, which simply snaps on and off - entirely unique among compact laptop sleeves. The full-features PowerSleeve sports seatbelt-nylon straps, a breathable and movable shoulder pad, and Booq's stylish black & metal zipper pulls. Be among the first in the world to receive a brand-new PowerSleeve17 and preorder right now! large back pocket for documents, media, iPod etc. With such products as the AMS MPD 2.5" enclosure with an internal rechargeable battery so you will not require bus power or eat up the battery life of your laptop, the original Cutie enclosures, and the Speedzter2, FireWire Depot is now shipping the newest version of the Cutie family, the Cutie DX ($124), and the newest entry, the Cutter 2.5" enclosure ($119). Knowing the needs of the user community, all of the enclosures can be bus powered from either a 6-pin FireWire port or a USB port. The FireWire/USB enclosures offer three connectivity solutions in one for Mac, PC, and Linux users: FireWire, USB 2.0, and USB 1.1. The device transfers data at speeds up to 400 Mbps (FireWire) and 480 Mbps (USB 2.0), 40 times faster than standard USB 1.1 connections. Since USB2 is backward compatible with USB 1.1, you can use it anywhere. The enclosures also support booting from the enclosure (based on the machine and OS you are using). All enclosures are compatible with Mac OS 8.6-9.2.2 and OS X, Windows 98SE to XP, and Linux distributions. The AMS, Cutie, Cutie DX, and Cutter enclosures all accept 9.5 mm laptop drives (currently as large as 60 GB). Apple has released a knowledge base article on identifying the input/output (I/O) ports of PowerBook G4 computers. eOrders.com, which recently launched a very nice free email service with POP3 and SMTP support, has decided to terminate free email due to massive abuse by scum-sucking vermin - a.k.a. spammers. "We regret to inform you that we have discontinued our Free Email Account Service. Much of our time, money, and effort has been directed to the prevention of reoccurring abuse. We would love to keep our free system running for everyone to use; unfortunately the majority of new email accounts registered daily abuse our system. We are sorry for any inconvenience this has caused." To temporarily reactivate your account to retrieve items, contact an eOrders Representative from the link on the Web page. The IOXperts 802.11b driver for Mac OS 8-9 and 802.11b driver for OS X let you use non-Apple 802.11b cards with your PowerBook. The first time you use the driver, and again when the demo period expires, you will see a dialog that allows you to enter a serial number or purchase the driver. Clicking on the "Buy" button will connect you with eSellerate to purchase a serial number. Each serial number is uniquely associated with one card. You can use the card on as many machines as you like, but you need a separate serial number for each card you want to use.